Hey Tillamook! It’s November, which is one of my favorite times of year because traditionally this is the time of year we pause and give thanks. November is also the month the Tillamook Family YMCA was founded in 1948. Looking back on 70 years of serving Tillamook County, the Y has changed both locations and design. As the membership grew and their needs grew, the Y incrementally expanded to include basketball courts, handball/racquetball courts, two pools and eventually a new fitness center. We feel so fortunate to have this great facility, and it’s one of our main goals to steward and take care of it. In my three years as the YMCA Executive Director, my goal has been to head towards sustainability and make a strategic effort to repair and upgrade the community cornerstone that you have created. I feel we’ve made some incredible strides on both fronts. We have improved our operational efficiency and closed most of our operational deficit, all while not turning anyone away who needs financial support. Many people do not know the Y costs $1.4 million/year to operate; our utilities alone were more than $115,000 last year. While improving our operating efficiency, we have also made a tremendous effort to make repairs: we repaired both failing pool systems; replaced the locker room floors; added swim suit dryers as an amenity for our members and guests; we replaced all our cardio equipment; repainted and refinished the racquet ball and basketball courts; and most recently, we’ve begun work on a new roof for our building, as well as brand new siding and windows and additional HVAC systems. All within the last three years! 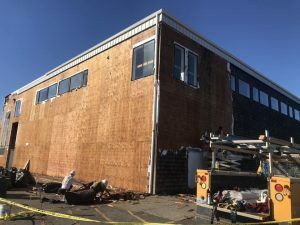 October 24, 2018 – Off came the old cedar shake siding on the YMCA’s building. And here’s the incredible part: almost all of this work was done with donations we’ve received from this community or through grant funding – not membership dollars. The donations we’ve received to improve our building have been off the charts and speak volumes to the generosity of this community and how much the Y means to every single one of you. I am confident in saying that we would never be able to make these upgrades and continue to improve the experience people have at the Y without the support of Tillamook County. This generosity is what I am most thankful for this November and every single day that I come to work and get to be a part of this community. As you can probably imagine, there is more work that needs to be done to keep up with the needs of our community. Our next big facility project will be repairing and potentially expanding the parking lot. We also have a lot of phenomenal community partnerships in place that are filling specific needs for both our membership and our community as a whole – including the 13,000-square-foot youth sports strength training complex out at the Port of Tillamook Bay, and we just recently paired up with Camp Makuala to offer affordable, overnight summer camps to kids. We’re looking forward to growing and fostering these partnerships for the betterment of the people we serve, and hope we’ll have your support for both. We’re also incredibly honored that the Tillamook Regional Medical Center has stepped up with a monthly donation to assist in the operating costs of the warm water therapy pool! They’ve committed to donating $1,000 a month for one year to help offset the costs the Y incurs. Over the next year, we will need other community partners to come forward and match the hospital’s monthly donation and keep the pool available. To wrap up, it is my great privilege to work for the YMCA and be a part of this community. The support we receive is overwhelming and encourages both myself and my staff to keep being our best and offering the best programs and services possible and creating a warm and welcoming facility that meets the needs of our community. If you would like to help support one of our programs or help meet the needs of our facility, we would be honored to have your help. You can donate online at tillamookymca.org/give or contact me at kaylan@tillamookymca.org. My door is always open and I love to chat and hear your stories, and hear feedback on how we can improve. Have a wonderful November, and live well everybody!